A wonderful tribute to the most influential and ambitious American pop group of all time. If there’s one band whose name and sound instantly evoke pleasant nostalgia, represent the sentiments of an entire generation, and showcase the changing landscape of a whole genre, it’s the Beach Boys. Founded in 1961 by brothers Dennis, Carl, and Brian Wilson, as well as their cousin, Mike Love, and friend, Al Jardine, it’s fair to say that no group (well, besides the Beatles) has influenced the backdrop of American pop music as much as they did. In commemoration of their fiftieth anniversary, the quintet recently released a six-disc box set, appropriately titled Made in California. A remarkably detailed and comprehensive collection, Made in California contains over “60 previously unreleased songs, home demos, alternate mixes, and live recordings.” These inclusions help trace the Boys’ increasingly ambitious harmonies and ever-growing palette of unique timbres, among other things. Best of all, they allow listeners to study thoroughly the progression of Brian Wilson’s masterful songwriting and arrangement skills, which eventually matured beyond those of his contemporaries. The first disc chronicles their earliest recordings through 1965, and it’s packed with gems. “Home Recordings/‘Surfin’” includes some studio banter and musical playfulness, which sets the stage well by showcasing how humble and inexperienced they were. Of course, popular songs like “Surfin’ Safari", “Surfin’ U.S.A.", “Be True to Your School", and “I Get Around” are here, displaying how the group started out as the voice for the model American teenager. Their take on Bobby Troup’s “Their Hearts Were Full of Spring” is a remarkable testament to how well their voices blended right from the start. Frankly, this disc also exemplifies how limited their thematic and melodic range was at the beginning -- there are plenty of songs about the same subject, and many of them use the same I-IV-V chord progression. Of course, this isn’t news to anyone, but it does make this disc feel slightly tedious nonetheless. Fortunately, songs like “In My Room", “Don’t Worry Baby", “Please Let Me Wonder", and “The Warmth of the Sun” exemplify that Wilson was keen to approach more introspective and adult topics as soon as he could. Those selections are still amongst his best. The subsequent LP contains material from 1965–1967, and it’s bound to be the favorite one for many people, including myself. Why? Because the majority of it consists of tracks from Pet Sounds (which is often considered thegreatest pop album of all time) and its ill-fated, brilliantly experimental follow-up, SMiLE (which, if completed and released as planned, would’ve stolen the declaration from its predecessor). From the former, “Wouldn’t It Be Nice", “Caroline, No", “I Just Wasn’t Made for These Times", and, of course, “God Only Knows” naturally stand out. Earlier tracks, like “Help Me, Ronda", “Let Him Run Wild", and “California Girls”, make an appearance too, as well as an interesting radio spot for “Wonderful KYA". Afterward, SMiLE dominates the second half of the disc, with “Good Vibrations” (which wasn’t originally part of the project) starting things off. Arguably the most complex and grand pop track ever made, its multifaceted structure and lovely density set a new benchmark for what could be done in the studio. Looking back at his earliest works, it’s fascinating to consider how far Wilson had come as a composer in only a few years. Elsewhere, the harmonies on “Our Prayer” are nothing short of heavenly, while the numerous takes of “Heroes and Villains” prove that its construction was just as complex as its completed form. These tracks, coupled with “The Elements: Fire", “Cabin Essence", and “Wonderful", showcase a vision too bold for his family and too experimental for commercial success, which led to Wilson literally becoming a tortured genius. Nevertheless, his “Symphony to God” remains one of the truest masterpieces in the genre. Disc three is also excellent, as it covers 1967–1971. Despite its campy lyrics, opener “Darlin’” still possess a strong verse melody and warm vibes; in fact, it sounds eerily like something the Turtles would’ve done around the same time. “Let the Wind Blow", in contrast, is forlorn and urgent, with a gripping chorus and somber production. It’s fantastic. “Friends” soars due to its exceptional harmonies and dynamics, while “Little Bird” features a wonderfully nuanced arrangement and plenty of varied timbres. “Do It Again” recalls the charm of earlier songs, though it’s arguably more sophisticated. There’s even a cover of “I Can Hear Music", as well as the tranquil and brief “I Went to Sleep", which sounds a bit like something from the Moody Blues’ Days of Future Past. Dennis Wilson’s “Forever” is here, too, and it’s sweet without being too sentimental or cheesy. The disc closes with two knockouts: “Til I Die” and “Surf’s Up". The former features one of Brian Wilson’s most subtle yet somber melodies, while the latter is arguably his most multifaceted and stunning piece ever. The closing vocal allusion to Wordworth’s “Child Is Father of the Man” is breathtaking no matter how many times you hear it. Oddly enough, the song was originally part of SMiLE, so its inclusion on this disc is a bit baffling, chronologically speaking. Unfortunately, the group begins to sound dated and fatigued on disc four. “Don’t Go Near the Water", as its title suggests, just isn’t much of a song. Tracks like “All This Is That” and “The Trader” feel like retreads of what the group has already done; they’re fine from a production and performance standpoint, but they offer nothing new to the cannon. The worst offenders are “Brian Is Back", which, despite its clever recalls of older charms, is uncomfortably lame in concept, and “Angel Come Home", which features terrible lead vocals and not much else. Although this fourth entry isn’t up to par, there are still some enjoyable moments, such as the engaging “Sail on Sailor” and the intricate “Marcella". The latter’s closing vocal puzzle is its saving grace. Although it sounds dated and its message is too familiar, “It’s Over Now” is worthwhile because of its sweeping strings and horns. Similarly, “Let Us Go on This Way” sounds like a slightly inferior lost piece from Pet Sounds. The fifth LP is split into two parts: “1980–2012” and “The Beach Boys Live". The first half contains the poorest selections, as the songwriting is bad and the production is noticeably lazy. For example, openers “Goin’ On” and “Why Don’t They Let Us Fall in Love” feel somewhat bare and by-the-numbers as they recall the waltz meter and simple songwriting of earlier hits. “Getcha Back” sounds as dated as just about anything else from the '80s (which is due primarily to the drum machine). There’s also “Kokomo", which, like the Bangles’ “Walk Like an Egyptian” and Todd Rundgren’s “Bang the Drum All Day", is paradoxically among their biggest hits while also being one of their weakest songs. The worst offender, however, is their cover of the Mamas & the Papas’ “California Dreamin’". The original was a masterpiece; this take is just lame and amateurish. Thankfully, there’s “That’s Why God Made the Radio” from their newest LP. Featuring tight harmonies and lush production, it’s a fantastic comeback. As for the live material, it fares pretty well overall. It spans 1965–1993 and features several great picks, including “Little Bird", “Friends”, “Help Me, Rhonda", “Sail on Sailor", and “Wonderful". There’s also a truly energetic version of “Wild Honey", as well as faithful covers of The Box Tops’ “The Letter” and Phil Spector’s “I Can Hear Music". Oddly enough, there’s also “Vegetables”, one of the more bizarre tracks from SMiLE, and thus one of the tracks that Mike Love probably disliked the most. They definitely do it justice, though. 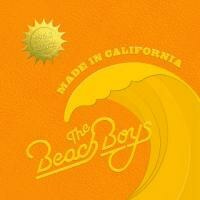 The final disc contains material “From the Vaults", and it’s almost guaranteed to be the biggest reason Beach Boy fans pick up Made in California. It starts off with a humorous radio spot from 1966 and then moves to an a cappella version of “Slip on Through” and an outtake of “Don’t Worry Baby". There are also alternate takes of “Good Vibrations", “California Girls", and “Surf’s Up", as well as live versions of “Wendy” and “When I Grow Up (To Be a Man)". The coolest inclusion is “SMiLE Backing Vocals Montage", which is self-explanatory and quite satisfying. It’s the purest testament to their vocal talent you’ll ever hear. Elsewhere, there’s a cover of “You’ve Lost that Lovin’ Feeling” and several instrumentals -- “Guess I’m Dumb”, “Mona Kana", “Had to Phone Ya", “Why”, and “Transcendental Meditation", among others. They’re all quite boisterous and beautiful aside for the latter, which is a bit monotonous. The disc ends with “Carl Wilson: Coda", a bittersweet acknowledgment that consists of Wilson speaking over “Good Vibrations” and a live excerpt. He asks Brian about the success of the group and Brian says that “the music celebrated the joy of life.” It’s a subtle but sentimental way to conclude the box set and summarize the group's legacy. If you couldn’t tell already, Made in California is the ultimate Beach Boys collection. It’s concise and endlessly intriguing (even when the music itself is lacking). Although the fourth and fifth discs have uninspiring cuts (and it would’ve been nice to have more studio banter), what is included is invaluable. Something like this shouldn’t be judged on the quality of every track anyway; it should be judged on how thoroughly it captures what the Beach Boys accomplished. In that respect, it’s as good as it gets. Few bands ever get such a loving commemoration, but then again, arguably no other band deserves it as much.